Harry Potter Lover? Make magical homemade birthday party invites for you child's next Harry Potter themed party. Just between you and me I would die for a wizards party with all the kids dressed up in their wizards capes and their wizards wands in hand. Very cool. The invitations of course would have to be the coolest ever to set the mood of the party. Wording for your party event can be in the form of the Acceptance letter to Hogwarts. If you have the Hogwarts school logo you could print up a letter head signed by the Headmistress or yourself as the deputy head. We are pleased to inform you that you have been accepted as a guest at the Harry Potter birthday party for Joann Crafty at Hogwarts School of Magic and Wizardry. 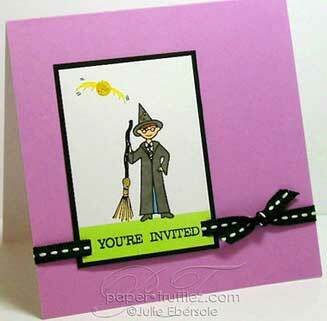 Make your birthday party invites in the shape of a wizards hat in the same style as this witches hat invitation. Harry potter stickers would be a cheap embellishment alternative. Why did you make them: I thought they would be fun and I help people learn how to make their own greeting cards, invitations and other paper-crafting projects with rubber stamps! Inspiration? Harry Potter Movies, of course! How did you make them: With rubber stamps, ink, paper, markers, etc. The images are hand-stamped and colored in and layered to pre-fab cards. How long it took: It was a sample prototype; about 15 minutes. Hints and Tips: Rubber stamps can be used over and over again, and often for a variety of uses!